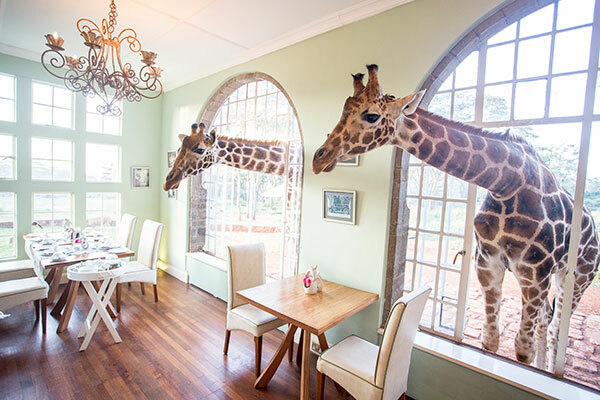 Home » Travel Blog » Staying at My Dream Hotel, Giraffe Manor! Staying at My Dream Hotel, Giraffe Manor! How many of you out there were the kids at the zoo who were in LOVE with the giraffes? Yep, me too! I was always fascinated by these strange and graceful creatures. Well, if you’re a giraffe lover at heart, have I got a place for you! Giraffe Manor is in Karen, Kenya, just outside of Nairobi. This magical place is a sanctuary for Rothschild Giraffes, a pretty rare breed of giraffe (the easiest way to tell different breeds apart is by their spots). The giraffes are free to wander the grounds as they please, but they come to the manor every day for feeding time! With only 12 rooms, Giraffe Manor offers a special experience for a small number of guests. Around 5 p.m. is when the magic begins. All guests are seated in front of the house with a beverage and the handlers start to call the giraffes up for dinner. Slowly but surely, they make their way across the yard and you get a chance to feed these wonderful animals. (Don’t worry, their diet is strictly monitored, so the pellets you feed them are healthy.) The giraffes are so wonderfully gentle and sweet. And if you are so inclined, you can put a pellet in your mouth and they will kiss you! Dinner at the manor is communal and lit by candlelight. After dinner, you can retire to the drawing room for a seat by the fire and an after-dinner drink. And the next morning, get ready for Big Eddie the giraffe to knock on your window for more food! It’s true—I saw him with his head in my mom’s window one morning. As you sit down for brekkie at 7 a.m., the giraffes are back to stick their heads inside the breakfast room, hoping for a treat. This place cannot be oversold; it is one of the most amazing experiences I have ever had in my life. The owners of the manor have attempted to keep the style and feel of the place from the 1930s, when the conservationists who started it lived there. So it certainly isn’t over-the-top luxurious, but the food is phenomenal and it has a certain colonial charm. We sat outside for lunch and had cheeky warthogs running around the area—think little Pumbas everywhere! 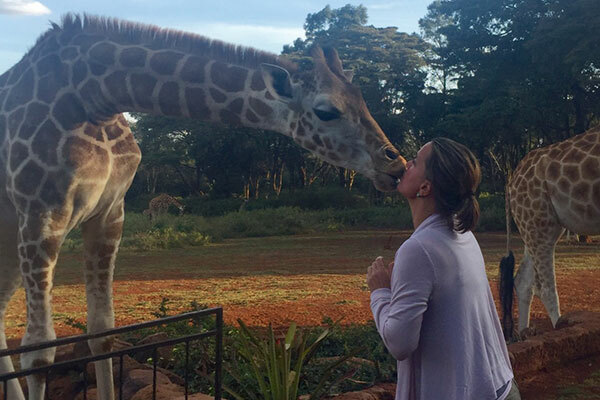 I would recommend 2 nights at Giraffe Manor, as the Sheldrick Trust (where you can watch baby elephants being fed), Karen Blixen Museum, and some cool local shopping are also in the area. Plus, the manor sits on the same land as the Giraffe Centre, where you can learn more about these magnificent animals. 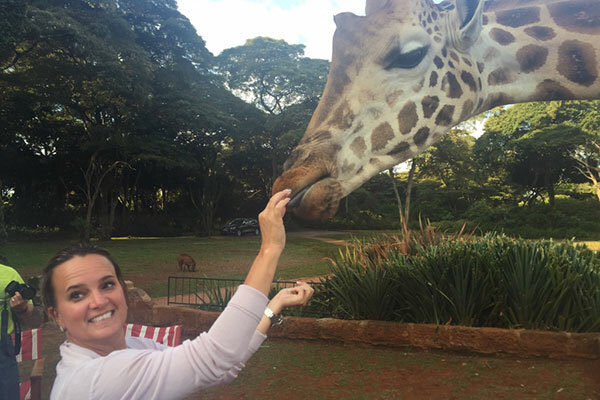 I would love to send you to Kenya to experience Giraffe Manor for yourself, so give me a call at (888) 367-0933 or send me an email!